Welcome to this week's Finance Fridays. Last week we were looking at bank current accounts and today's topic is switching energy suppliers. With the dark evenings and a cold blast expected this weekend it's the time of year when our energy consumption is at its highest. 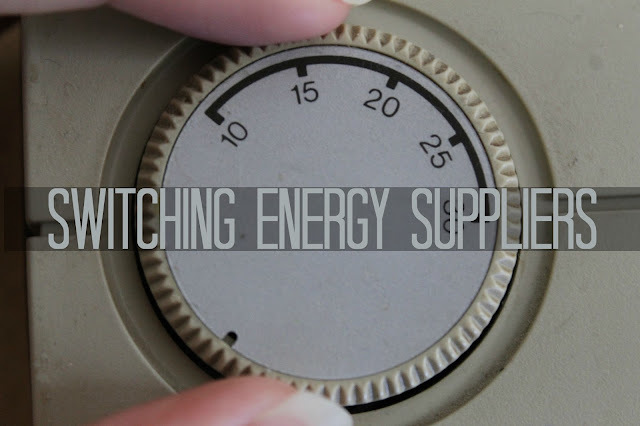 My thoughts on this subject were ignited last week when I got my half yearly energy bill. The background to this is back in May our dual fuel monthly direct debit was reduced from £78 per month to £40. We were also £80 in credit on our account and this was returned into our bank account. We didn't request either of things and I wasn't happy about it. You may wonder why I wouldn't be happy about lower bills and extra money in our bank account but I knew it couldn't last. The £40 per month would cover the summer months but not the winter months. So last week our bill stated it was going from £40 per month to £117! Now if there's one thing you need to know about me it's you don't mess with the Ness! One Twitter message and several direct messages later and I was on a new tariff and the new monthly direct debit is now £67 per month. What if I hadn't managed to lower my bill? Since my tariff was coming to end this month it would have been best to shop around and find a new energy supplier. With such a choice of suppliers and tariffs there's a lot to think about so here's some tips to finding the best deal. Get accurate comparisons – There are several reputable comparison websites about and in theory it should be easy to search for the best deals. Do make sure they are available in your area as some suppliers are regional. You'll also need to look at the terms of the tariff such as how you pay it and how you need to manage the account as listed below. Look at your latest bills – To get the most accurate picture of your account you'll need at least a year's worth of bills. If you're using a comparison site enter the amount of energy you have used (usually in kWh) rather than the amount you have paid. Pay by direct debit – It's far cheaper for companies to have their bills paid by direct debit rather than by cash or cheque and this is reflected in the tariff. Even the most basic of bank accounts allow for direct debits to be set up so try to pay this way if you can. Duel benefits – If you have gas and electric quite often a supplier will give a discount if you you take both gas and electric from them. Do check though that this discount still works out better than having separate suppliers. Get online – In recent years I've managed to get a cheaper tariff by managing my account online. This means that I get emails rather than paper bills and I get a reminder every couple of months to send my meter readings in. If your bills are often estimated you could be underpaying by quite a bit of money so it's worth keeping them up to date. Energy is energy – Unlike broadband speeds and reliability the gas and electric which comes into your house is the same no matter what provider you chose. If you decide to change suppliers you shouldn't notice any disruption in service as no new wiring or pipes need to be fitted. What will differ is the quality of service. Hopefully you will never have a problem or query with your bill but if you do look at their record of complaint handling. Cancellation fees – Some providers make it as hard as possible to leave by having termination fees. By leaving it could cost you more than you save with a different provider. Usually you will need to wait until your tariff ends to escape without paying. Keep in credit – If you are in debt with your current supplier you may not be allowed to leave until you have paid it all off. Do make sure if you are in credit that when you switch that you do receive it back when you leave. Have you ever changed energy suppliers? Do you regularly review your energy tariff? If you want to join in with this week's Finance Fridays then add your link to the linky below. Any post concerning financial matters is allowed. Full details here. It doesn't have to be published today as you have until 23.55 on Tuesday 24th November 2015 to join in. Grab my badge below for your blog post. This is all very practical advice, thank you.